Some musicians seem to be made for each other, as is the case with these three Australian masters, Marc Hannaford on piano, Scott Tinkler on trumpet and Simon Barker on drums, who have released albums in various bands and settings, most of which are easy to recommend, and as can be suspected, reviewed on this blog in the past years. I have no clue what the title means nor what it refers to. What matters is the music, which consists of one long improvised track of fourty-eight minutes, extremely jazzy in its phrasings and rhythms, full of pulse and nervous tension, and possibly the most amazing thing is the interaction between the three, which is phenomenal by the coherence of it, the space they leave each other, without ever letting go of the density and dynamic undercurrents, even when Hannaford takes the foreground after eighteen minutes for a piano solo, the pulse remains and the drums kick in easily, challenging the incredible rhythm, yet the next best thing about the overall sound is that all three musicians have both percussive and lyrical roles, not only alternating them, but playing them simultaneously, easy to believe from a piano player, but here it's also true for Tinkler, who is a rhythmic improviser, and Barker whose lyricism on drums equals his percussive power. And then you have the telepathic interplay, including intense moments that suddenly end in silence for a second, only to move forward again, and in a long improvisation, this requires some strong listening skills and good knowledge of each other's playing. The second part of the piece is a little less energetic, yet the tension is maintained, with Hannaford and Tinkler exchanging some abstract and eery phrases, but beautiful, beautiful, and then Barker kicks them back to full energy nearing the end, for a kind of grand finale, but beautiful, beautiful and intense. The album is dedicated to Australian alto saxophonist David Ades, who passed away yesterday. 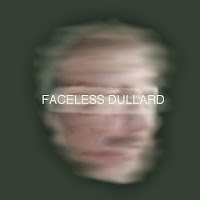 “Dullard” means a slow or stupid person and “faceless” means remote or impersonal. This might be an expression referring to bureaucrats or the like. Thanks Colin, that I got ... but it still remains a mystery that such a title ends up on an album...what's the link with the music? Sorry Stef, when you said “I have no clue what the title means nor what it refers to” I read that rather literally, and thought you didn’t know what “faceless dullard” meant. I’ve no idea what it refers to musically, but that’s not altogether surprising. Often titles are given retrospectively, and are prompted by matters entirely personal to the musicians.